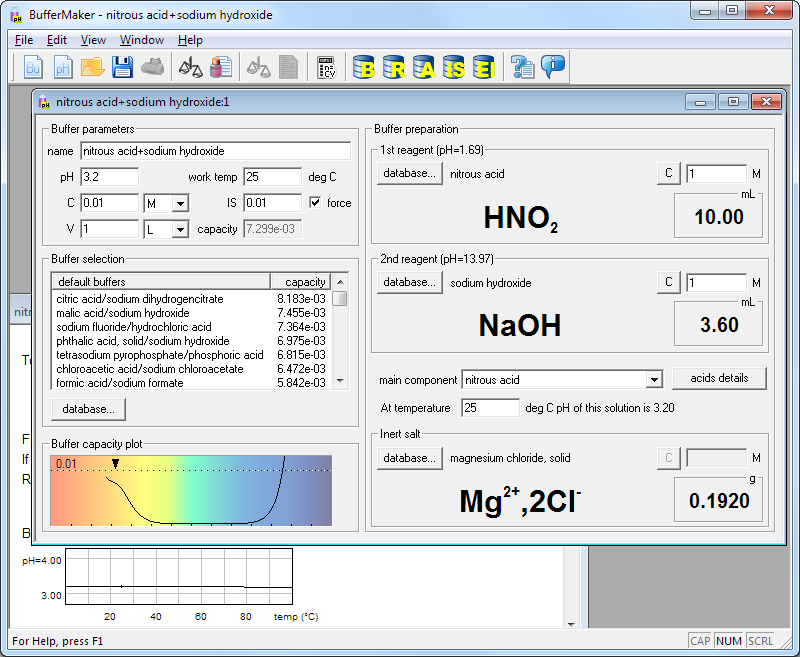 Once you are done with the screen shots, select buffer preparation or pH calculator to learn how to use dialog windows shown here. Screen shot below shows the most important features of the program. 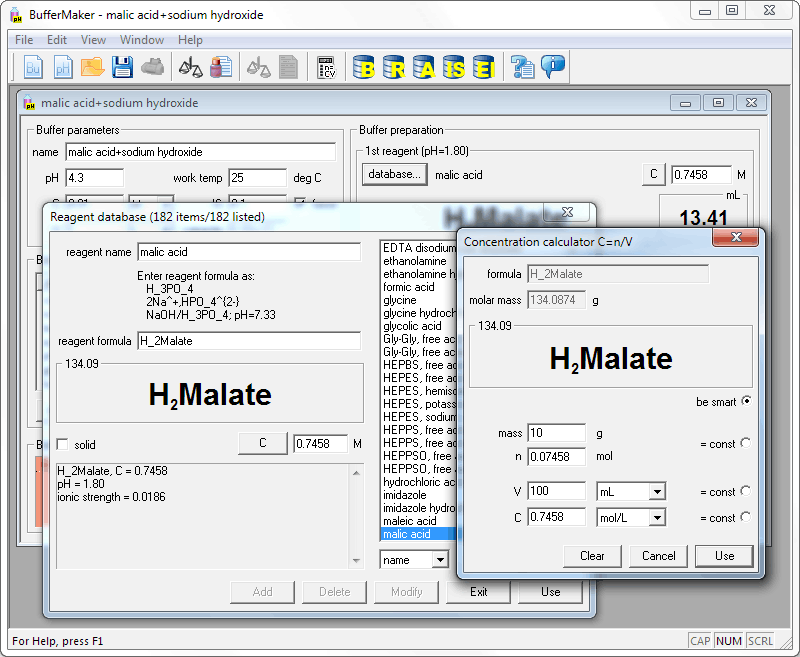 In the simplest case you enter information about your buffer in the left upper frame (titled Buffer parameters), then you select buffer from the list - and Buffer Maker displays volumes or masses of the reagents that have to be used to prepare required buffer (see frame titled Buffer preparation on the right, note inert salt used to fix ionic strength of the solution). Reagents don't have to be simple acids or bases - they can be almost anything, like salts, double salts, salts mixtures or even buffers. Not only amounts of substances are automatically calculated, but also plot of buffer capacity and - in the printable buffer recipe view, seen here below main buffer dialog - plot of buffer pH vs temperature. Second screen shot shows several other features of the program. To make it easier to deal with organic molecules you may define your own moieties or abbreviations (like Acetate, EDTA, PIPE), which helps enter formulas in readable format. One of the most important objects used in the program is a reagent - which is something you may have standing in a bottle. You may enter reagent composition in reagent database dialog window, using almost standard chemical formulas, slightly extended to help you communicate with Buffer Maker. Quite often concentrations of reagents are given as - say - 10 grams per liter. To convert these numbers to molarities you can use built in concentration calculator. 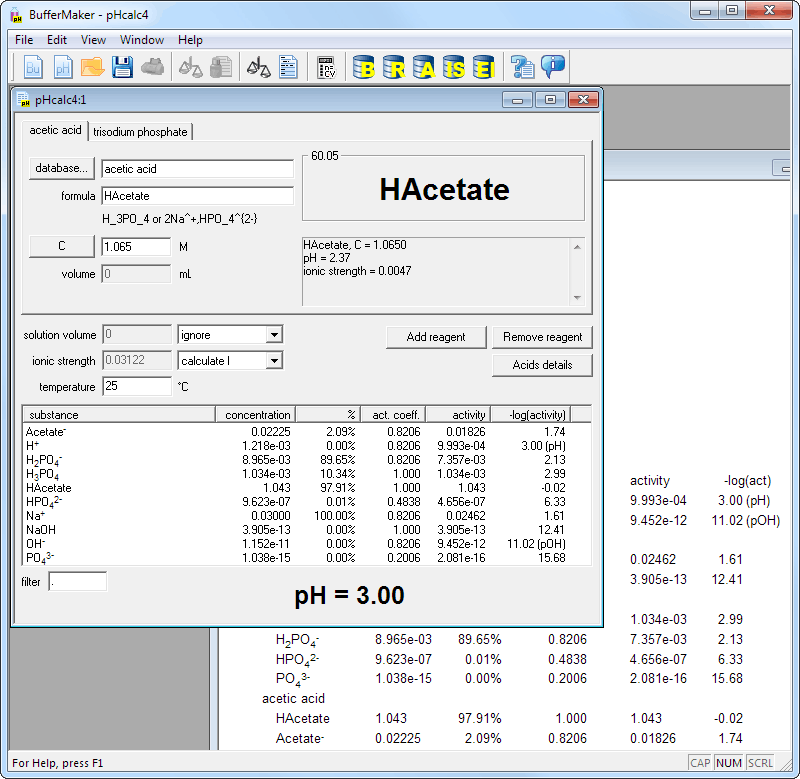 Finally, program can be used not only for buffer preparation and design, but also for calculation of pH. You can mix any number of acids and bases, or salts - and you will get not only pH value, but also information about concentrations of all species present in the solution, together with their activities and fractions of the analytical (formal) concentration. This is only a fraction of program features, feel free to browse the site to see more, or to download the free 30-day trial to try Buffer Maker by yourself. You may also download just Buffer Maker help file in Windows chm format.